To remove the food cravings which are the causes of overeating you first need to fully understand that habitual or compulsive overeating is not based on any actual physical need. You may frequently feel "hungry" but it's not your body that needs or even wants that extra food, rather it is the mind that's telling you that you do. The superficial causes of overeating can be varied but they are all based on psychology and emotion, more specifically relating to stress and possibly low self esteem. The tendency to habitually overeat crosses many if not all boundaries of age, gender and social position. It can however be either more or less common in some different cultural and societal backgrounds. In relation to gender, women do tend to be a bit more at risk of developing an eating disorder than men generally are, but plenty of men are at risk too. Stress can indirectly cause overeating through the stress causing an increase in the supply of a hormone called cortisol which can lead to increased heart rate and blood flow, similar to a mild adrenaline rush. Sometimes this stress response can then cause increased appetite which is based on the body feeling that it needs more fuel to supply the increased metabolic activity caused by the cortisol. So while there is indeed a physical "cause", that physical or metabolic process is initially set in motion by some form of psychological and/or emotional stress. If stress is only experienced fairly infrequently then it can in fact lessen appetite temporarily. In these circumstances the hypothalamus in the brain produces hormones that can decrease appetite. However if stress or pressure of some kind is more on going and persistent then levels of cortisol also tend to increase and remain at an elevated level, subsequently causing an increase in appetite. It's also been established that stress can influence the kind of food choices that you make. Research has shown that when your stress level is persistently elevated there is a tendency to increase intake of food with high sugar and fat content. These kind of foods have the temporary effect of lowering stress, hence the term "comfort" food, but this then leads to increased psychological dependency on these high fat and sugar foods thereby underpinning the stress factor. In conjunction with this, stressed people tend to exercise less and sometimes drink more alcohol, also contributory factors in weight gain. When someone with a habitual eating disorder consumes a large amount of food they often feel a sense of satisfaction, even mild euphoria. This is due to the effect of the temporary stress reducing hormones released into the metabolism, the "comfort" food factor. They are released temporarily from the psychological and emotional effects of the underlying stress that they're living with and it is this which sustains and maintains their psychological addiction to overeating. Periodic attempts to undertake diet regimes usually fail because the self denial of the food "high" leads to feelings of frustration and depression which sooner or later wins over the desire to stop overeating, the will to persist collapses and a return to habitual overeating becomes inevitable, and the whole cycle begins again. The causes of overeating are ultimately psychological and emotional, not physical, though at times it may feel "physical". In order to get to the root of what causes habitual overeating the underlying psychological issue of stress must be addressed. 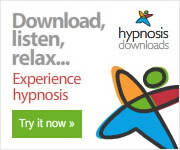 Hypnosis is a highly effective method which can be used to resolve this and break once and for all the back and forth cycle of dieting and relapse.